OPPONENT BLASTER was created to speed-up the opponents in Brøderbund's Stunts, because they are too slow to challenge any human driver. You want to make Bernie as fast as Skid? Then this program is for you! 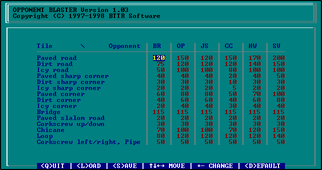 OPPONENT BLASTER displays the speed values (in mph) of all 6 computer drivers currently used in the game, so they can be easily compared to each other. OPPONENT BLASTER needs the uncrypted OPP?.RES files, that's why it works only with version 1.00 (dated October 05, 1990) of Stunts. 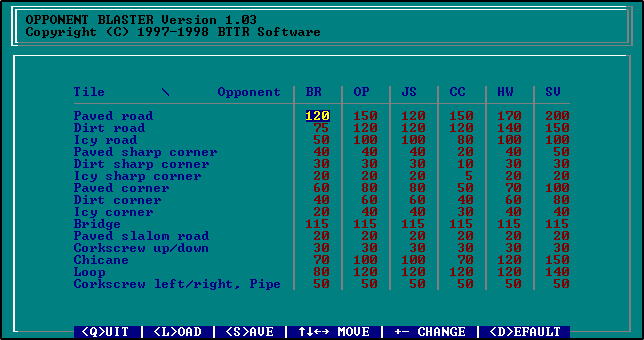 Screenshot #1: Opponent Blaster 1.03 with default values loaded.